This week’s post is in honor of our African American veterans who served during World War II. As we all know, African Americans were not given the opportunity to serve in combat units until World War II. Blacks were almost always given the undesirable duties which were usually not what a soldier dreams of when volunteering to protect their country. These duties included grave registration, supply units, and construction, among other assignments. Slowly but surely, these men were overcoming generations of discrimination to prove they were as patriotic as any white man. Considered the hallmark of African American advancement, The Tuskegee Airmen, along with many other all black units, changed the way Americans viewed African American contributions in the war effort. For decades, the popular belief was that African Americans were not motivated enough for combat duty. They would not fight aggressively enough, they would not be patriotic enough, and they would not be able to maintain the required skills of a white soldier. Clearly, the over 100,000 African Americans serving in World War II, and in past conflicts, have proved that theory wrong time and time again. Despite the fact that the Airmen were so influential, not only to the war effort, but also to the beginnings of the Civil Rights movement, many people have only just begun to acknowledge their legacy. Before World War II, the United States Army was so sure African Americans could not perform in combat, that the Army War College conducted a study in 1925 that ‘proved’ African-Americans were both physically and psychologically unfit for combat duty. When military advances were being made, especially in the years leading up to the Second World War, the government refused to open special training schools for blacks in the military, but through the determination of the NAACP, black press, a lawsuit, and influence from the President and First Lady Roosevelt, the Army conceded to the “Tuskegee Experiment”, which would train African Americans in combat aviation. Located at the Tuskegee University, Alabama, the Army Air Corps began training on July 19, 1941. Ironically, aviation is considered one of the most psychologically and academically challenging professions in the military. 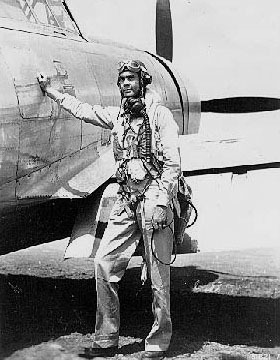 Twelve cadets and one officer, Captain Benjamin O. Davis, Jr. (the future first African American general in the Air Force) made up the first squadron to pass through the program that would eventually become the 99th Pursuit Squadron, or more popularly known, “Tuskegee Airmen”. Immediately, they began combat missions in the Mediterranean Theater, and eventually joined with newer squadrons to form the 332nd Fighter Group. Not only were the Airmen successful, despite bets they would fail, they became envied by most other pilots because of their success. The Tuskegee Airmen proved to be some of the most talented pilots in the war effort and began the movement to fully integrate the U.S. Military by 1948. Their determination propelled the Civil Rights Movement into a force to be reckoned with in the eyes of the government. The population could no longer ignore the rights and talents of the black community. Not only that, but many of these men were able to continue their educations after the war, in areas of study such as law, political science, medicine, and education, continuing on a cherished legacy. It is a true testament to the will of these brave men that 926 Tuskegee Airmen were able to define the way the U.S. Military viewed African-American service in a time when it was socially acceptable to discriminate.